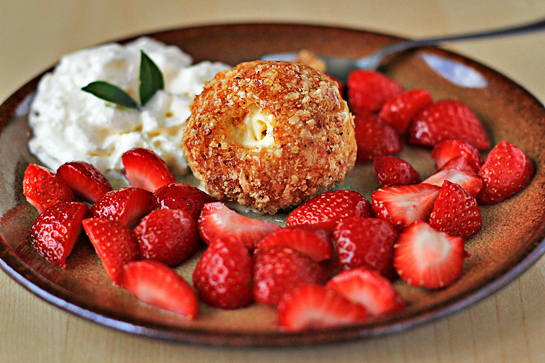 I’ve been astounded at the whole concept of fried ice cream for quite some time. As a devoted foodie and one of the most curious creatures on the planet, I just needed to find out. So the big day has come. I grabbed the necessary ingredients and tools and started exploring. 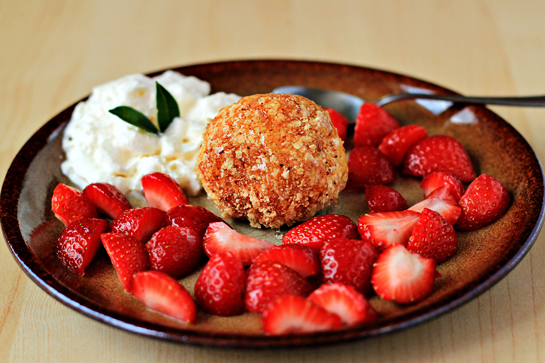 And I’ve found out this: fried ice cream is surprisingly easy to make (if you know the tricks), it is beyond tasty, and you hear a lot of ‘WOW’ from your family and guests when you serve it. To start the whole process, you will need these ingredients. 1. 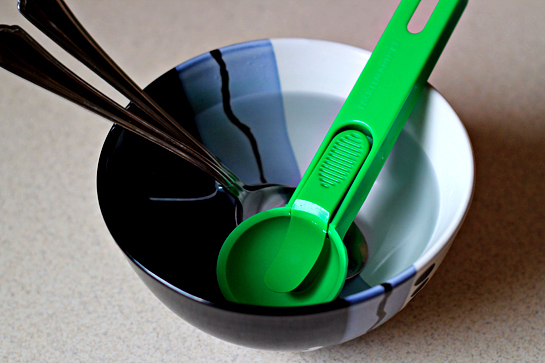 You will also need an ice cream scoop (or two soup spoons). I dipped them in warm water, it helps to scoop the ice cream more smoothly. 2. Grab your favorite ice cream. Vanilla is my favorite, hands down. 3. 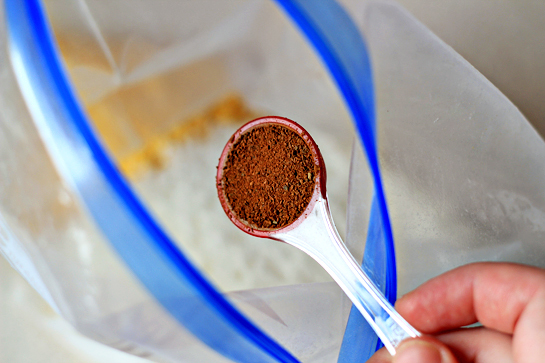 Using the scoop or two spoons, make 8 1/2-cup scoops. 4. 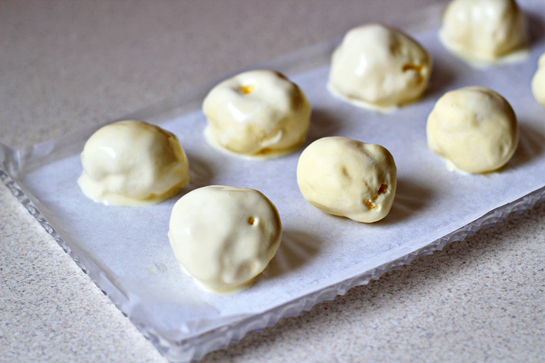 Drop the scoops of ice cream onto a tray lined with waxed paper. To make the surface of the scoops more even, I rolled them between the palms of my hands for a very, very little while. 5. Place the ice cream scoops into the freezer for about 1 hour. … crush the corn flakes. 9. Shake the ingredients until they combine nicely. 10. 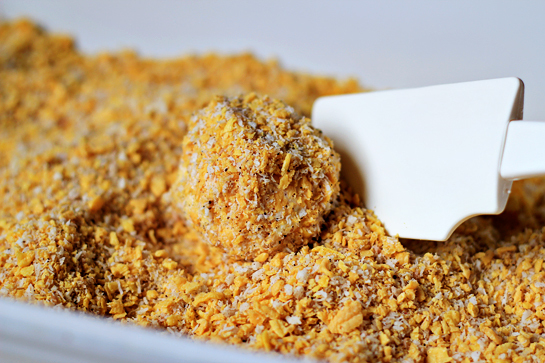 Place the coating ingredients in a shallow bowl. 11. 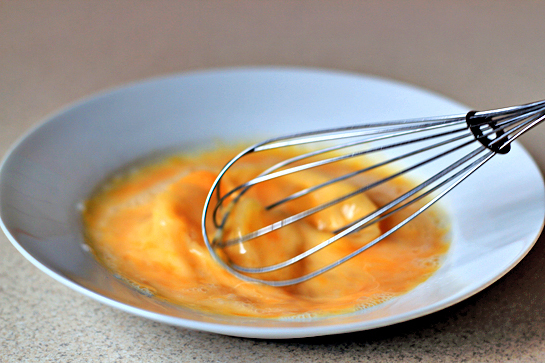 In a plate, whisk the eggs with milk for about 1 minute. 14. …and finally in the dry coating mixture again. 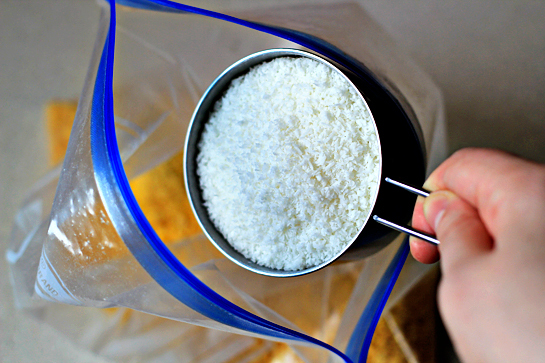 You can now use the palms of your hands again to help the corn flakes adhere to the surface of the scoops better. But keep it short, the ice cream gets soft quickly. 15. 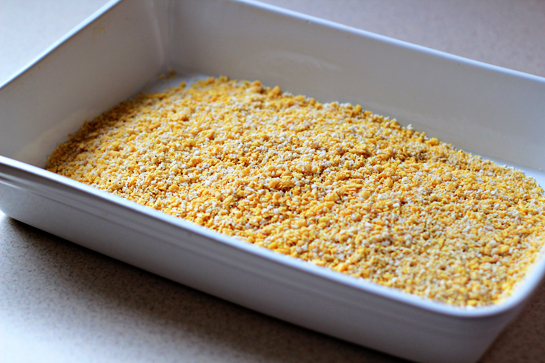 Place on a tray or plate lined with waxed paper and return to the freezer for at least 3 hours. 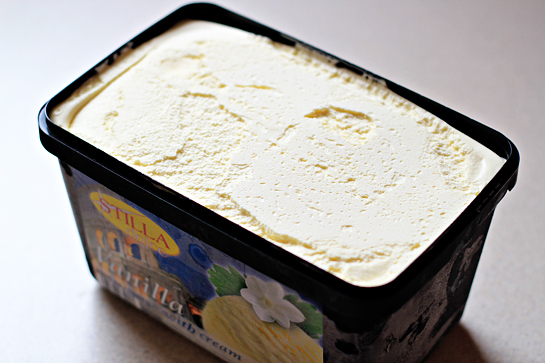 It is very important to freeze the ice cream until it is very hard. I recommend leaving the scoops in the freezer overnight, if possible. 16. 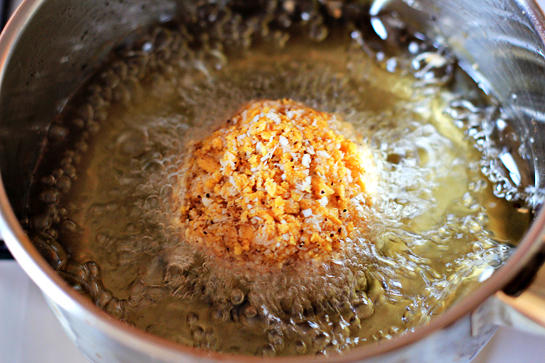 In a small saucepan, heat the oil until medium-hot (about 360 °F – 200 °C). 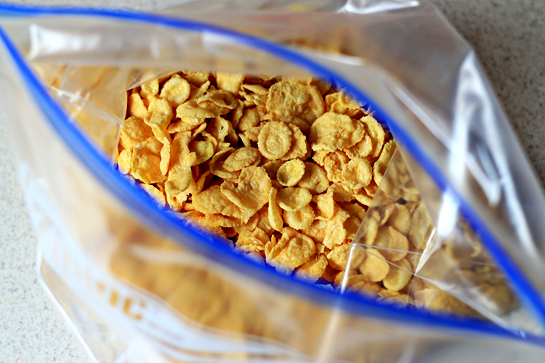 To test whether the oil is the right temperature, drop one corn flake into the pan. If within a 20-second period its edges turn slightly brown, then the temperature is just fine. 17. Removing the ice cream scoops from the freezer one at a time, drop them into the hot oil and fry for 20-25 seconds, turning them halfway through. 18. 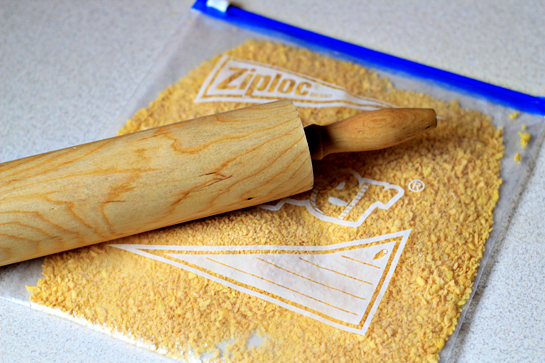 Then remove the scoops from the oil and place them on paper towels to absorb the grease. 19. 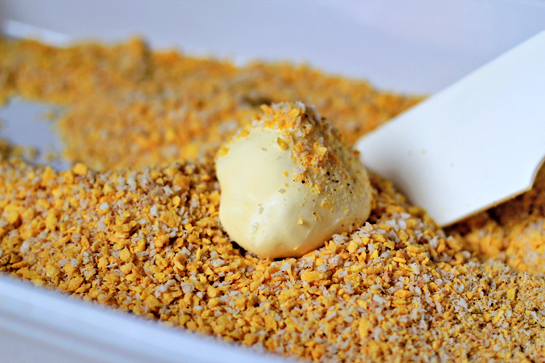 Drizzle each scoop with one teaspoon honey and serve immediately. Instead of honey, you can drizzle with any topping you like – toffee, chocolate, fruit. And most importantly, enjoy dear friends. This is poetry on a plate. So, what do you think? Would you try this? And if so, what ice cream flavor and toppings would you choose? I looked and looked for this recipe. Thanks for making it available. I served this at a party and it was completely gone. They did not left even a small portion for me. Imagine ? I have bookmarked this and I will make this as my specialty. 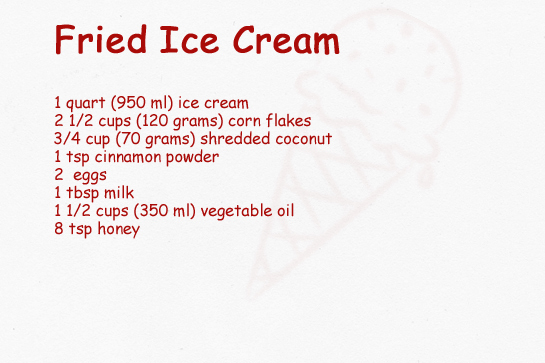 Just this recipe I made yesterday rolled in nuts and coconut … my ice cream still in the fridge, I’ll try tomorrow! Thanks! I love ice cream of all kinds and flavors. This is very delicious. Thank you. 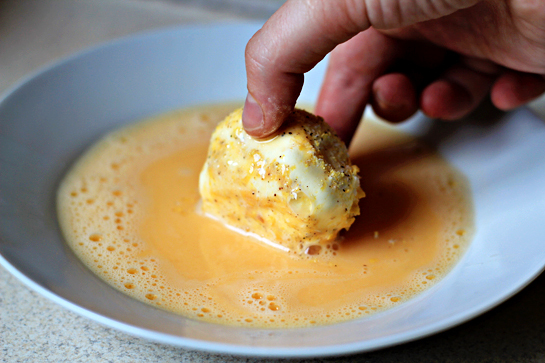 My husband loves deep fried ice cream and has been bugging me to find a way to make him some for 10 years. (!!) Thank you for sharing this wonderful recipe. Hey… I tried it out… Came out very well… But guess I have to reduce the amount of Coconut next time as I am not very fond of coconut even though I am from Kerala(India) which is a land of Coconuts… 🙂 Apart from that, it was AWESOME! Thank you so much! I see this opening doors to you trying fried cheesecake next. haha! Thank you so much for this recipe i have been craving this so much lately and i am totally going to make this! Thank you so much! I’ve made this before, using cinnamon Life cereal, you don’t have to egg wash and fry it. much easier. Try it, you’ll like it. Thanks for your recipe, this is the first one I’ve found that actually fries it. I used to have fried ice cream at an Italian restaurant in Santa Clara, California many years ago and just fell in love with it. Have never run across a recipe for it before and will definitely try this one. 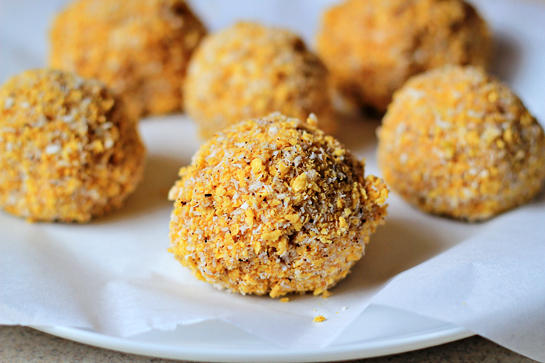 Have no idea if this recipe is anything like the original fried ice cream I had before though. I know the picture sure looks like what I had. Thanks much. I love fried ice cream!!! But it is so much better the Mexican way with a fried tortilla underneath. RV ON THE NORTHERN CAL COAST THIS MARCH, 2013. WILL REPORT. I’m allergic to coconut! Is there anything I can use as a substitute? I just made this right now. i didnt have coconut so i left that out. it was soooo yummy and even better than my local thai restaurant. thanx! can I fry it up and freeze it overnight and serve the next day? I don’t want to make it table side for 14 people.